This is my GM Style Manual. My Players Handbook is called Halberds & Helmets. It is an instruction manual on how to to run the games the way I do. My advice is obviously colored by my preference for old school D&D sandbox campaigns and player agency. This text has been integrated into the Halberds and Helmets PDF. Keep it short: My main problem is that I don’t want to spend a lot of time in preparation for a session. Half an hour for a three hour slot is all I’m prepared to invest. Campaign Map: When I start a new campaign, I create a small hex map. It’s not too big. A simple 5×5 hex map is usually enough. I like to start with a wilderness surrounding a small village. In the wilderness, travelling a hex takes a day. That keeps things simple. See below for more on traveling. As the players push forward, keep expanding the map. Maybe you already have a bigger map available to you. 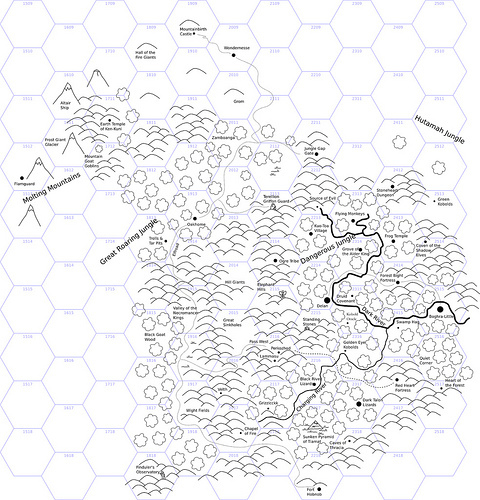 You could use my random hexmap generator, for example. I only start worrying about the ruins and lairs in the various hexes once players actually explore the region. This is going to be an organic campaign. Use every idea as soon as possible. Do not save good ideas for later! Use them now. You will have more good ideas in the future. Settlements: Every settlement has two or three interesting, named people. These are the people of authority the characters are likely to talk to. Every settlement should have a building or two where you can find said named people, and an inn, or an exaplanation for the missing inn. Don’t bother with a map for the settlement. Dungeons: I like to pick a handful of One Page Dungeon Contest entries and place them on the campaign map. I make note of a few rumors that would lead the party to the various dungeons and warnings they might hear in order to prepare them for it. This is a sandbox campaign and the encounters do not depend on the power level of the party. Instead, the party gets to choose the risk they are willing to face by choosing areas that are more or less dangerous based on the rumors they hear. Even if the party decides to leave for the first dungeon, that still gives you some time to provide additional information and tie-ins for the remaining handful of dungeons the party is not visiting right now. Use the time to make up some events surrounding the dungeons the party did not investigate. Giant frog plague? Cultists spreading? Rival party found some treasure? Stocking the dungeon: This is uses a single d20 roll instead of the two d6 rolls that Moldvay uses. Random Wilderness Encounters: Based on the current area the party is in, jot down a little random encounter table. Consider the critters in the surrounding dungeons, think of a theme, browse the monster manuals and look at the pictures. If you like beholders, maybe add a dwarf merchant with an extra eye stalk or two to the encounter table. He’s a spy for the beholder! If you like slaadi, go for an amphibian theme and pick kuo-toa, giant frogs, toads, froglings, bullywugs, and so on. If you have a theme, consider antagonists. Is the frog faction competing with the gnomes? Add a gnome entry! If you have a little extra time, add one or more entries for peaceful folk from the neighborhood or named people from nearby settlements. Two of these is a good number. Add these at the top of the list. During the night, add this number as you roll. This is how you get slightly different results for day time and night time encounters. In the following example, merchants and soldiers are only encountered during the day. At night, add +2 to your roll. Thus, kuo-to a and slaadi are only encountered during the night. ▒ 6 ▒ roll twice: fight! You can keep using the same table while the player characters are in the same region. A typical region is an area of 5×5 hexes. Exploration: Typically travel is initiated by a non-player characters telling the player characters about a location. Usually directions are accurate and the location and any landmarks on the way get placed on the player map. When traveling, player characters cannot get lost. A hex is usually big enough for multiple locations (a hill, a lake, a castle, a village, a dungeon). Unknown locations might not be easy to find. Use the typical search abilities: 1/6 per day for humans, 2/6 per day for demi-humans. Known locations can always be found. Travel: The default is one hex traveled per day unless there are roads (two per day; no bonus for riding or flying) or they are traveling by ship along a coast (in which case it’ll be eight hexes per day). As it stands, this ignores movement speeds and hex size. You travel one hex per day, that’s it. I usually think that one hex is five miles, but players don’t need to know that. Lairs: Many hexes have a building of some sort. I like to I add One Page Dungeons. I place other stuff I got from the net or from books I bought. I add lairs for all the intelligent monsters on my encounter tables. As time passes, I might add more locations and lairs to known hexes. It’s simply not possible to completely map a hex of nearly 22 mi². There’s always more stuff to discover. Don’t be afraid to add new stuff to old hexes. If you have some monsters on your random encounter table and haven’t decided where the lairs of these creatures are, there’s a 1 in 6 chance when encountering them that you’ve found their lair. Let players find the secret gnome village, the slaad temple, the frogling pond. These improvised lairs will necessarily be simple one, two or three room affairs. No problem. Monsters: It’s easier if monsters announce themselves: let players find, smell or hear something. This allows them to choose their approach. Determine encounters before the game starts or have a procedure to determine the number of monsters encountered ready. Use 1d8 if you’re at a loss. This makes sure that you’re not scaling the encounter to the players. Let the players decide whether to engage or not. Adapt the encounter as it happens. If your players are bored, let the monsters fight. If your players need guidance, have the monsters talk. If your players are afraid, make it easy to avoid the encounter. The entertainment of your friends at the table takes priority. A total party kill can be part of it. Know your players. Reactions: Use the reaction roll. Not all encounters need to run badly. Morale: Use morale checks ins combat. Not all fights are to the death. Roll 2d6. Enemies need to roll their morale or lower in order to stay in the fight. Let player tactics designed to impress and scare their enemies result in morale rolls but stop after two or three. After a bit of fighting, blood lust and battle rage take over. Treasure: I just roll for random treasure. Treasure spent earns experience: 1 gp is worth 1 XP. Investments: Have a list of buildings prices available for characters to build. Here’s the list I started my campaign with. Keep adding as characters gain more gold. Remember that all major buildings need gardeners, guards, artisans and so on. Use the rules on specialists to get started. Ordinary servants earn 1gp/month. Spies earn around 500gp/month. Sages earn around 2000gp/month. News: Spies and Sages are a great investment because they allow you to feed setting informtion to your players. Get into the habit of preparing a little something to report for every spy and every sage in the employ of player characters. Actionable information is preferred. Activities of rivals that can be stopped. Rumors of treasures that can be sought. Reports of legends that let players know where to go next if they want to pursue a certain goal. Keep Adding: In order add life to the world, you need to have two or three events or changes happen between sessions if time passes in-game. A lot of it should relate to what the party did. If their dog was killed by a giant crab and they didn’t rescue it, then there will be a rumor of a ghost dog haunting the beaches. If they discovered skeletons in a crypt and fled, they have released undead that will be roaming the neighborhood. If they had hirelings with them, those will be spreading rumors of a necromancer. Use these rumors to add big and small adventure options for the players to focus on. Magic Items: These are usually not for sale unless for potions. These can be bought from alchemists. Every alchemist has a hand full of potions they know how to make. The cost around 500 gold. I like magic weapons. If I roll up a simple +1 weapon I often pimp it with some extra feature, or make it intelligent. Focus Follows Players: As time passes, you should see a constant trickle of little ideas to add to your campaign. Prepare for 3-7 of these potential adventures and keep a list of open plots to remind players of ongoing issues. Automatically, more adventures will develop wherever the party shows up. If the party fights a mammoth and decides to track it back to the forest, then maybe there will be neanderthals living there. If the players try to contact them, maybe there will be a sabre-toothed cat and a velociraptor in the area. If they investigate the velociraptor, they might find a valley full of dinosaurs. Essentially players express their interest in the campaign by spending time. If players never leave town, then they want urban adventures. If they keep returning to your megadungeon, then that’s what they want. Giving players real options will make sure the game adapts to their preferences (and yours, given that you are providing the options). Names: Keep lists of names to assign to non-player characters. I like names to depend on gender and culture, so I usually have multiple lists. Contacts: Keep a list of contacts. These provide easy plot hooks. Magic-users provide new spells in exchange for quests. Sages provide information about items found in exchange for quests. Rulers provide men-at-arms in exchange for quests. They can provide rumors and gossip that hint at things to get involved in. Provide enough to allow choice but not too much in order to save preparation time and avoid decision paralysis. Keep it somewhere between three and seven. I also like to play up alignment. A drug abusing alchemist hands out chaotic quests, a curious insect trainer hands out lawful quests. Maps: Maps are inspiring. They provide a sense of place, every landmark they contain is a potential exploration goal, yet another option for players to pursue. Keep a campaign map, hand out treasure maps, let other characters draw maps for the party. Players need options, and maps are like option tokens. Maps are also props that are very easy to make. Player Goals: Talk to your players about their character goals every now and then. Identify the players that have interesting goals you’d like to pursue, and start providing rumors that lead to adventures on the way to achieving those goals. Not everybody needs to have goals! You just need enough player goals to add adventure seeds to your campaign. If all the players have divergent goals, they end up not having a reason to adventure together. In that case you might be better off adding a traditional villain to the mix: A powerful nemesis that sends minions after the characters, builds an army to attack their home base, coordinates the bad guys in the region such that the party absolutely needs to fight. Just increase the pressure whenever the players are starting to squabble again. Character Spotlight: I like to give enemies the opportunity to shine every now and then. Don’t overdo it. I find that providing a single non-player character the opportunity to shine in a session is about right. The same is true for player characters. I’ll try to emphasize situations where a player character specifically did something awesome. It lets players know that I appreciated their character being there and the things they did. Everybody likes this. If a player is very entertaining in the game, I like to encourage them. Non-player characters will go along with a lot of silliness as long as it doesn’t strain my credulity. Even quiet players like to shine. Sometimes you just have to guess what makes them tick. Perhaps they’d like romantic success? As the extroverts grab the spotlight, make sure to interrupt the action once or twice per session and offer a scene to an introverted player. The leader is charmed by their presence, the enemy wants to talk to nobody else but them, the farmers ask them for advice. Don’t overdo it. Sometimes shy players don’t want to make big decisions. A public display of respect or admiration might be enough. Player Planning: If players invest a lot of time into a particular plan, I like to join in and provide advice—my commentary stands in for their character’s knowledge of the world. I also like to reward players for the effort having their plans succeed. Avoid the evil feedback loop of foiling their plans. They’ll counter it by spending even more time planning or by trying to keep you out of the planning phase. This makes the session boring. Be sure to recapitulate the successful execution of the plan, coloring it appropriately. If you feel that they over-planned it, make sure you use words like “boring wait” and “endless hours pouring over your preparations” as you remind them of the time wasted in-game. If players don’t want to plan a lot, then that’s even more awesome, because it gives you the opportunity to improvise some action scene. Roll for wandering monsters or the like and go for it. Avoid boring “it doesn’t work” results. Succeed or fail spectacularly. Character Background: I tend to prefer character accomplishments to character abilities. Thus, player characters in my games are mechanically simple. If a player wants to do something that I think is out of the ordinary, I ask for an explanation: “Do you think your character can do this?” If the player says yes, then we think of an explanation and have the player write it down on the character sheet. That’s how we learn that the dwarf as in fact served as a scout and an ensign in the dwarven army. Character Development: Hopefully the events at the table shape the characters. Was the character generous or avaricious? Was the character diplomatic or rude? Was the character honest or deceitful? That’s what we need all the social encounters for. By interacting with other characters, players can develop their own character. Therefore they need to meet people that can be cheated or dealt with honestly. They need to meet people that can be robbed and people that beg. It forces players to make choices regarding their characters. It’s how they grow to be more real. Avoid situations where there is only one course of action. If you can only rescue the baron’s child, then there’s no choice involved. You should add temptation at every single step. Slavers will be interested in the child. Enemies of the baron will be interested. Sometimes there are no obvious choices, and none of the choices will help define the character in obvious ways. The baron’s child might not want to return back home, preferring to go on adventure instead. The character’s choice will define what they see as filial duty and family integrity. Hardly heroic decisions to be made! Use these situations rarely. Influence and Reputation: Find a way to let characters gain influence and a reputation through adventuring. This anchors them in the campaign world and encourages character development instead of character ability gain. It’s a different sort of reward. The following list is from the Hack & Slash blog. Related: Solipsistic Hexes by Brendan. See my hex crawl procedure and the discussion that resulted.